... I think I'll go crazy. Oh wait, I'm already there. I got a late start on cutting because I realized that my large ruler didn't have the 60 degree marks on it. I ordered one online last Friday with free 2 day shipping but due to an unexpected delay while in transit it didn't arrive until yesterday. Needless to say, I've been doing a marathon cutting session today. And I still have a few more triangles to cut out because one of my fat quarters (the solid orange I added) was stained when I unfolded it. I'll have to return it tomorrow. Your stack of triangles looks wonderful!! Can't wait to see them sewn in rows!! Very colorful stack of triangles. Have fun using them. I feel your pain! Been there, done that! 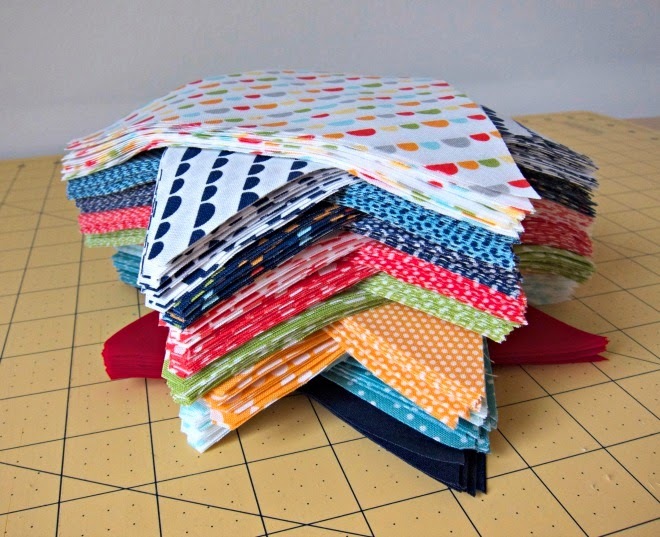 I cut 1242 triangles out for the quilt that is on my bed. I didn't do the math before I started, obviously. Hang in there, the end result will be worth it.